Nowadays, with all the advancements in camera equipment and techniques, we have seen a sudden influx of new photographers, all wanting to show off their work in the best way possible. This has created a higher demand for high quality websites, and it has had a positive effect on the world of Wordpress photography themes. The number of themes has increased considerably, and they keep developing into more beautiful and functional ways of showcasing one’s work, be it as an amateur photographer, or as a professional. 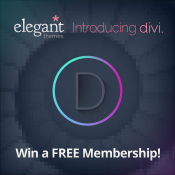 Today we teamed up with Elegant Themes to give you a great opportunity to get access to all of their products forever including updates and support! Three Lifetime Accounts worth $747 are awaiting for you!